I love one pot meals, don’t you? Especially when I’m camping. Fewer dishes to wash means more quality time spent around the campfire. This an easy camping recipe that combines the savory flavor of smoked turkey sausage with lots of veggie goodness. It can serve as a delicious dinner or you could add an over easy egg to the top and you’ve got a hearty breakfast. 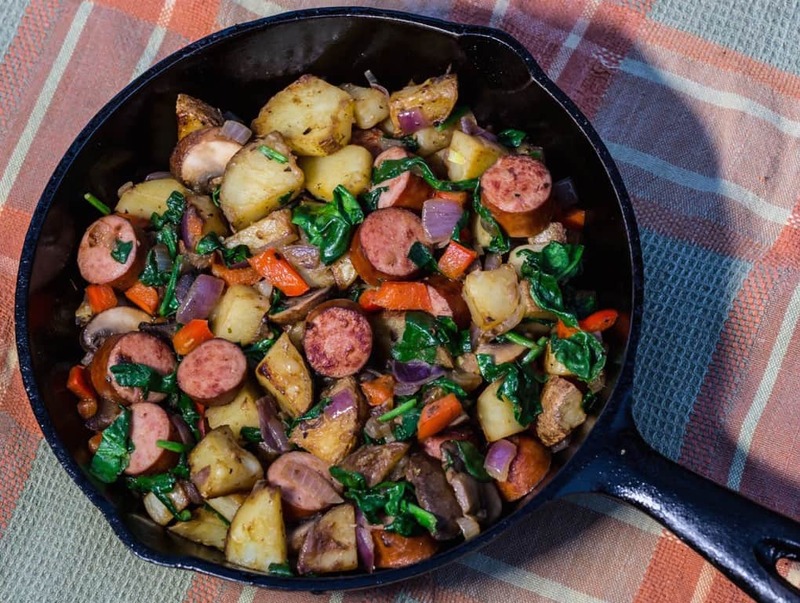 The ingredients are very flexible, you could substitute the turkey sausage for kielbasa, switch out the spinach for kale, or get creative with your own combinations. It doesn’t take very long to prepare, as long as you keep an eye on the potatoes and onions and stir them occasionally, you can chop the rest of the veggies while the potatoes and onions are cooking. Serve with a side of sliced tomatoes. Yum! An easy camping recipe combining the savory flavor of smoked turkey sausage with lots of veggie goodness. Heat the olive oil and butter in a 10" skillet over medium heat. While the oil and butter are heating, slice the sausage horizontally into ½" slices. When the sausage slices are browned, remove them from the pan with a slotted spoon, place in a bowl and cover with aluminum foil or a plate to keep them warm. Remove the vegetables from the pan with a slotted spoon, placing them in the covered bowl with the sausage. Drizzle a little more olive oil in the pan, if needed. Add sausage and vegetable mixture from the bowl back into the pan, add the red pepper flakes then toss together for 1 minute to reheat the sausage and vegetables before serving.